When you sit down to watch a film made with Spielberg behind the camera and Tom Hanks in front of it, you feel in reliably good hands. It's almost like being surrounded by family. 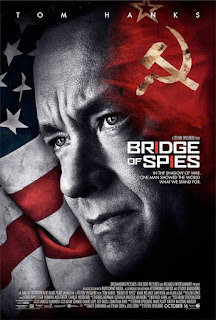 Bridge of Spies makes good on that promise, delivering a stylish and superbly crafted thriller set during the Cold War, even if it does never really transform into anything particularly special. Hanks is on the top of his game, as he always is, and he layers his character with depth and background: we feel as if we know a lot more about him than we actually do. Surprisingly, though, the film is stolen by Mark Rylance, who has more then earned his Academy Award nomination with his portrayal of Rudolf Abel. Rylance is benefited by the film's excellent script (penned by Joel and Ethan Coen), but he plays his role with an enormous sense of control; simultaneously Abel feels powerful, vulnerable, controlling and scared. It's a supremely impressive array of feelings and emotions, and Rylance sells them all. Bridge of Spies might not scale the enormous heights of other Spielberg efforts, but it remains an enjoyable and intelligent thriller that, when viewed technically, scarcely puts a foot wrong. It can be argued that the film is perhaps overlong, at two hours and twenty minutes it occasionally feels like events are being stalled, but when you have a film so well acted and so visually pleasing this isn't too much of a concern. Let's be honest here, we have a film written by the Coen Brothers, directed and produced by Steven Spielberg, and starring Tom Hanks. It may not be as phenomenally great as that lineup suggests, but this is a reliably good espionage thriller that boasts pretty great work from everyone involved, and is packed with a plethora of tiny details that all achieve exactly the reaction they set out to. It's nothing mind blowing, but it knows what it wants to be and it manages to be exactly that. To Summarise: Overlong it may be, but Bridge of Spies remains a tense and compelling historical thriller thanks to an excellent cast and reliably strong directorial work from Steven Spielberg.